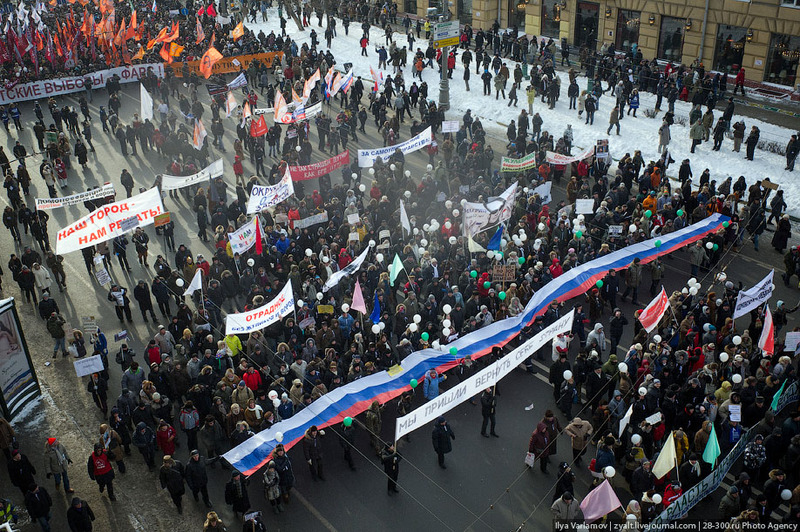 AP reported Saturday’s demonstrations in Moscow as follows. For the anti-Putin (”For Clean Elections”) demonstration in Bolotnaya Square: “The protest — which drew 120,000 people, according to organizers”. However, thanks to the New Media, we no longer have to swallow what the Associated Press says. Here are photos of the pro-Putin demonstration and here are films. Poklonnaya Gora is a very large space and, as this photo shows, it was full (the distance from where the photo was taken to the buildings in the background is about 700 metres). Here is a space calculator with which, dear readers, you are invited to play, comparing the photograph and your estimate of how tightly packed the crowd is. (When the program loads, hit the button that says НАЧАТЬ and move the tabs at the top around to fit what you estimate the photo to show). You will have no problem getting more than 100,000 and perhaps as many as 150,000. A far distance from AP’s “no more than 20,000”. And also consider how many buses it would take to bus them in. If 50,000 were bussed in, that would be more than 1000 buses which would amount to a tightly-packed line of buses 10 kilometres long or about the distance from Poklonnaya Gora to the Kremlin walls and back again. Surely someone would have noticed! By the way, note the little high narrow church to the right: that is St George’s Church in Poklonnaya Gora. If you see it on TV purporting to be the anti-Putin demo – as apparently has happened at least once – you’ll know you’re being manipulated. 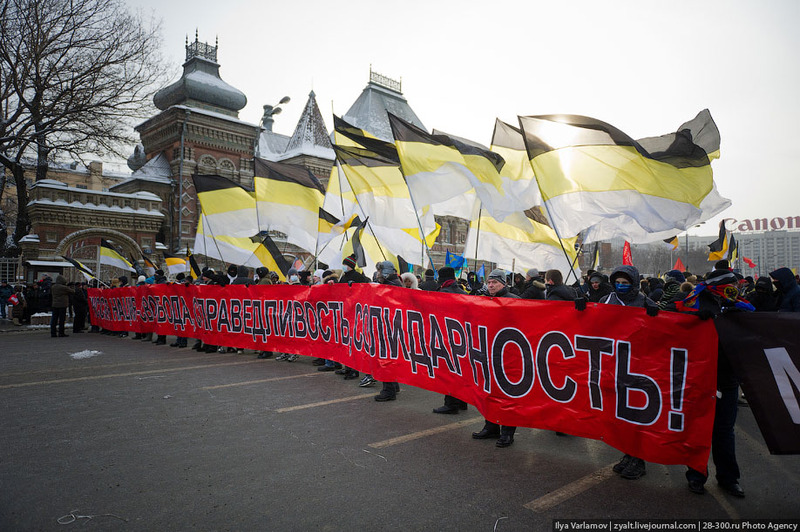 Here are two photo sets of the anti-Putin demos and a space calculator for that. For contrast, here is an overhead photo of Saturday’s demonstration and one of December’s demonstration in the same place. Large to be sure, “tens of thousands” certainly, but not nearly the same number as before and nowhere near the 120,000 that AP happily quoted the organisers (not, usually, an unbiased source) as claiming. But, the truth is that the pro-Putin demo pulled more people than the anti-Putin demo. Here is a very partial list of media outlets that repeated AP’s version: Globe and Mail (Canada); Daily Mail, Guardian (UK); NY Daily News, Fox, ABC, NPR, Time, Salon (USA); Hurriyet (Turkey); Drogheda (Ireland); India Times (India). And so on. 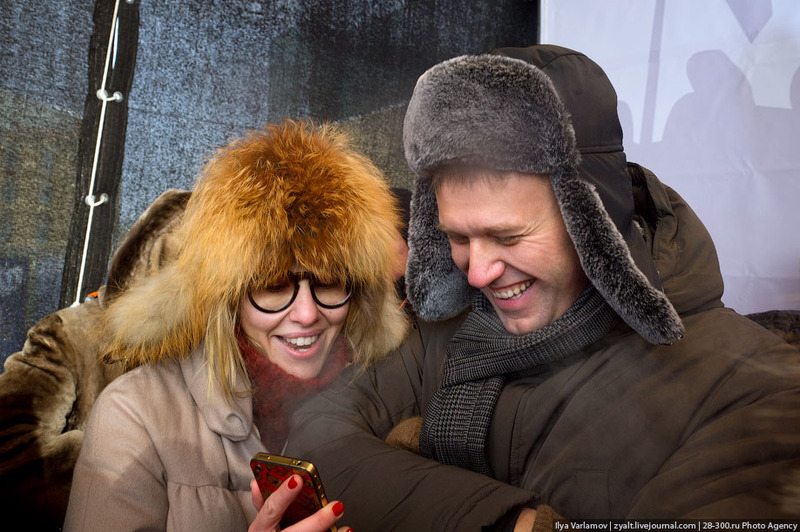 A Google search on “‘Putin drew no more than 20,000 people’ Moscow” returns over 7000 hits. A lot of news outlets apparently agree AP brings “truth to the world”. But not in this case. It’s time to ask yourself why you pay for your newspaper subscription. One can understand why many Russians think that there is a “media war” on against them. CANDIDATES. The rules say that nominees of parties in the Duma are easily registered. So Putin (United Russia), Mironov (Just Russia), Zhirinovsky (LDPR) and Zyuganov (KPRF) were all registered early. Independents must produce two million signatures (a process that requires money and organisation). Mikhail Prokhorov (independent), who has lots of the first, passed and was officially registered The CEC rejected Yavlinskiy (Yabloko) saying that a second check of 400,000 signatures turned up 23% invalid. Yavlinskiy says he will appeal. This would mean that Yabloko members could not be elections observers but Putin and Prokhorov have said they will give them mandates to do so. The signature collection process is rife with fraud and easily-discovered technicalities. POLLS. A number of opinion polls show that Putin&Co have recovered their position and make it likely that he will win it on the first ballot. Number two is Zyuganov and number three is Zhirinovskiy. And thus it has ever been. “Liberals” are at the margin of error. Prokhorov, who has said that he intends to be the consolidated anti-Putin candidate, has a distance to go from his current rating of 3-4% to get enough to force a run-off. Mironov maybe (maybe) could get himself up to Zhirinovskiy’s level. Another VTsIOM poll puts Putin and Medvedev as the best leaders of the last century (Brezhnev and Nikolay II third and fourth, Yeltsin and Gorbachev last). WEBCAMS. Here’s a graphic on how webcams in voting stations will be organised. DEMOS. Last week Moscow City approved several political demos for tomorrow and assigned real estate. The vote fraud people can have up to 50K at Bolotnaya Sq; a group headed by Konstantin Borovoy can have 30K at Sakharov Avenue (no idea what line they will be pushing); 15K at a pro-Putin demo at Poklonnaya Gora and 1.5K of Zhirinovskiy’s people at Pushkin Sq. We shall see what all this brings. MARS PROBE. The recent Russian probe mission to Phobos failed. A government commission has blamed programming errors (and possibly counterfeit circuit boards). The formerly routine success of Russia’s space launches has stumbled a bit lately, but a Russian re-supply mission docked at the ISS last week. And a good thing too – Russia is the only operating connection these days. CORRUPTION. According to the Interior Ministry the average bribe size in Russia more than doubled in 2011 (to about US$8000). Two deductions: still lots of corruption, but it is becoming more expensive and therefore dangerous. Fines upon conviction have been hugely increased – millions now. RUSSIA INC. An official of the Central Bank said there are no plans to change the distribution of foreign currencies in which reserves are held. About a half trillion USD, the current breakdown is nearly half USD, 40% Euros and the remainder in other currencies (including 1% in CAD). WEAPONRY. The Armed Forces will buy some Italian light armoured vehicles; the Bulava SLBM is declared ready to be purchased. Meanwhile they will scrap 3 million tonnes (!) of ammunition. And – at last – improve storage of the remainder. MISSED OPPORTUNITY. Sergey Ivanov told the BBC Taliban offered Russia an anti-US alliance and was rudely rejected. Putin, at his first meeting with Bush, warned him the USA was on the target list. But instead of taking up these possibilities, we preferred to expand NATO, listen to the anti-Russia lobby and fall in love with Saakashvili. CANADA SPY. I say nothing until I see evidence he was passing information to Russia. The Western news media is too prone to reflexively blame Russia. For example see the ridiculous Moskalenko example. (And here’s Canada’s CBC being suckered by the story). SYRIA. Clinton said that a “Libya scenario” would not happen in Syria. Well, that promise isn’t worth much: a “Libya scenario” wasn’t planned in Libya either; it happened because the no-fly zone had little effect and NATO could not be seen to lose. Moscow no longer believes mere promises. KACZYNSKI CRASH. And some more support for what has been the Russian line all along: the Polish Supreme Audit Office has found numerous violations in organisation of VIP flights. Hasn’t stopped the conspiracy theories though.